The first time I saw Trae Young (December 30th, 2017) play a full game, I lost my mind for a bit. This is hardly something to be ashamed of or to apologize for. Without pangs of momentary inspiration and even occasional overreaction, what are we? Pre-programmed overly rational beings subsisting on sterile logic and rationale? Part of what makes us human is our ability to feel, free of judgment, to exist in a moment, to imagine. This is why Trae Young has become an object of emotional overreaction – both good and bad. So what? First the bad, the sober, the audit. For an NBA lottery pick, Young is slight of build. He’s 6’2” with a 6’3” wingspan and somewhere around 180-185 pounds. These measurements compare nicely with Jay Williams, Jordan Farmar, and Luke Ridnour. Unlike Williams and Farmar, Young isn’t an electric athlete. He has quickness and good instincts, but he’s not an exceptional leaper or explosive off the dribble. In his one year at Oklahoma, while he drew a lot of fouls (8.6 FTA/gm; sixth in the NCAA in FTAs) and didn’t physically breakdown, he was corralable by smart defenses and struggled at times to finish over size. His finishing was exacerbated by his decision making. Young is challenging to scout because his role at OU was so unflinchingly imbalanced: he was everything and everyone and so his decision making which could, at times, be described as abominable, becomes slightly less abominable against the context of his setting in Norman. And this decision making extends into every part of his offensive game: pulling up from 30-plus feet with plenty of time on the shot clock, penetrating into the jaws of the defense and leaving his feet in the lane and then flinging up contested and impossible shots, and making those same forays but instead of forcing the shot, forcing a pass into a tangle of long arms (5.2 turnovers/game). Defensively, he doesn’t have the greatest physical makeup for a defender, but we’ve seen enough players to know effort and technique can mask physical limitations. In Young’s case, I frequently watched him standing straight up and down, considering taking an opportunistic approach to defending, but in the end opting to take no approach. His go-to move when getting screened was to wilt and make no attempt at fighting through. Similar to Young’s overly-relied-upon role on offense, I wonder (wishful thinking?) if some of this was enablement, maybe Young preserving his energy to continue carrying the team on offense. Effort is table stakes and not bringing effort is a sin even for the atheistic. All of the above make Young’s NBA candidacy, while obvious, something that stirs up the bubble guts. If Big 12 teams could hassle him into the brink of the abyss, then what of Boston or Golden State or Utah or Patrick Beverley or Fred Van Vleet? If Alabama’s Herb Jones (6’7” with a wingspan around 7-feet) can frustrate him, then what of longer, stronger, better NBA wings? 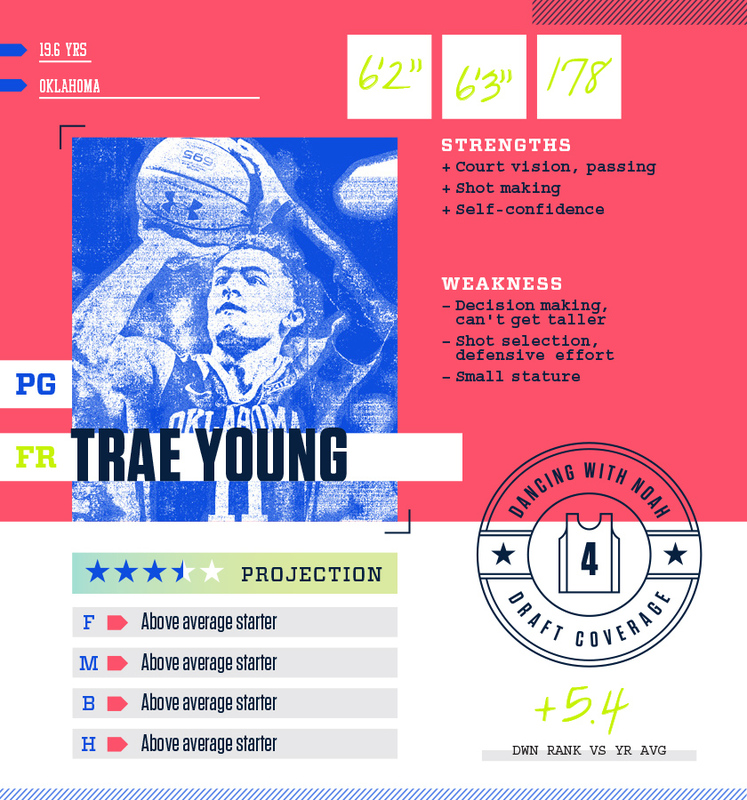 Despite the physical limitations, coaching gaps, and decision making, Young averaged over 27-points and nearly nine assists. He made 118 threes on 36% shooting despite 74% of his total three-point-attempts coming from beyond the NBA line and 102 of those 241 coming from 30-feet or deeper (per CleaningTheGlass.com). His coaches struggled to develop any type of cohesion between Young’s supernova flaming balls of 35-foot-three-point bombs and his talented, if overshadowed, teammates. As the season progressed, entire defenses were stacked up to slow or stop him and they usually succeeded. My first reaction when I saw Young’s combine measurements was to drop him down my big board. It wasn’t far (4th to 5th), but I thought it validated the concerns I’d seen; namely that he could be neutralized by length on the perimeter or interior; that his physical limitations would only be exacerbated in the NBA. As I’ve had time to process these prospects and Young’s game, I’ve realized that his skill and ability exceed the shortcomings. Decision making can be learned. Effort can be drilled. To be 19 with infinite range and preternatural vision is to inspire awe that makes people compare you to Steph Curry and Steve Nash. In draft terms, it’s not important that Young becomes Curry or Nash or Pete Maravich. It’s that he could, that it’s actually a possibility. That potential alone is enough to light up butterflies. That it’s purely potential and not realized against NBA men is probably causing reflux. Somewhere between butterflies and reflux lies the future of Trae Young.